Don Drysdale's baseball cards and autographed memorabilia trade at values consistent and reflective of his Hall of Fame status. An accomplished pitcher, the nine-time All-Star helped lead the Dodgers to three World Series Championships. 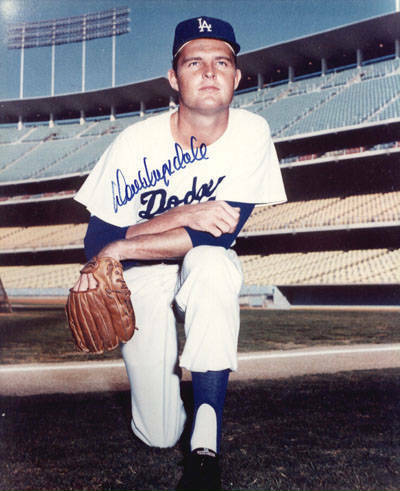 He holds a special place in the hearts of Dodgers fans who watched Drysdale become one of the most dominant pitchers of his era. 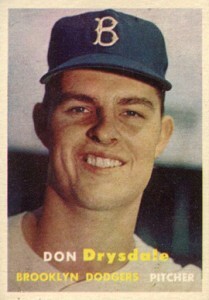 Don Drysdale's cardboard debut was made as part of the 1957 Topps Baseball set. High-grade version of his Topps RC can command several thousand dollars on the secondary market. Player collectors will also want to chase down his Dodger's team issue from 1956 (#7), as well as one that was part of the Jay Publishing World Series Pack (#16). With regards to Drysdale's modern cards, he has relatively few for a player of his caliber. His first autographed card is part of the 1993 Nabisco All-Stars set. 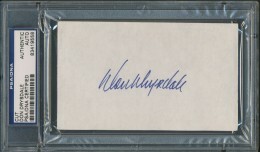 His first certified autographed card made by a major manufacturer came several years later, in the 2001 SP Legendary Cuts product by Upper Deck. Each of the 12 serial numbered cards included a cut signature of the Dodger great, who had died soon after the signing of the Nabisco product. Drysdale's first memorabilia cards were also made by Upper Deck in the year 2000. 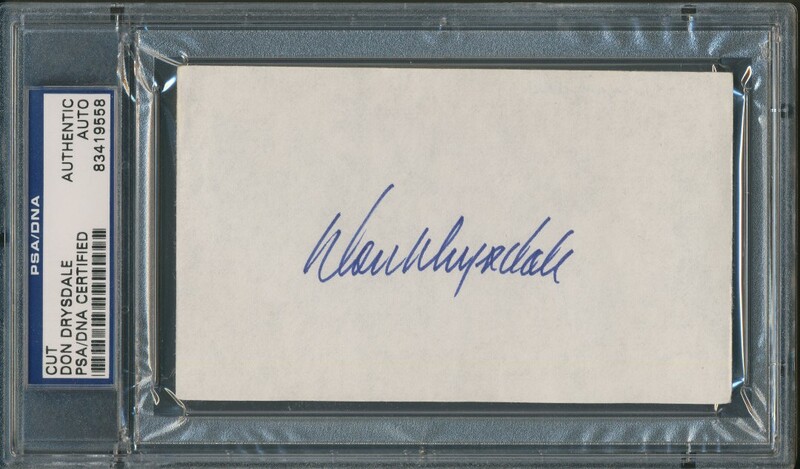 He was included on the memorabilia checklist of both the Brooklyn Dodgers Master Collection and Legends products. All of the memorabilia cards included in those products showcase a swatch of a game-worn Don Drysadale jersey. A busy post-playing career in broadcasting and an early death, translates to precious few legitimate autographs for the Dodgers' hurler. A willing in-person signer at the park, he died just prior to the birth of major regional and national autograph shows. Team signed items from the Dodger's championship days can sell for thousands of dollars. The clean, no-nonsense design of the 1957 Topps Baseball set has always been popular with vintage collectors. Drysdale's card is a perfect example of how a large portrait and minimal text can create a lasting treasure. 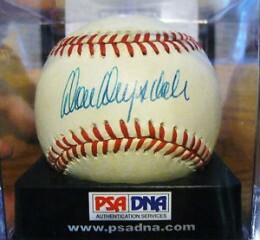 Below you will find an example of what Don Drysdale's authentic signature looks like. This can be used as a first point of reference for determining the legitimacy of autograph memorabilia, but is not a substitute for having your items authenticated by a well-respected professional autograph authentication company. Some of the trusted sources within the sports memorabilia market include the following companies: PSA, JSA, Steiner, Mounted Memories and Tristar. Click on any of the images below to view full size photos. Don Drysdale signature has remained consistent over time, and consists of a rapid series of loops and lines with minimal stops and starts. The signature is not easy to decipher letter-by-letter, as many of the letters look the same. The first and last names are nearly connected. The most legible area of the signature is "d-a-l-e."
Fluid, even handed pen strokes create a unique uniform look.